Go green without sacrificing your lifestyle! 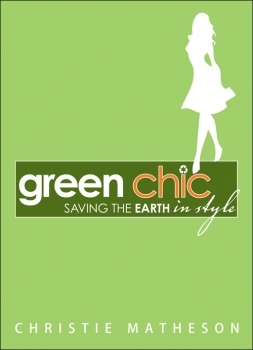 Author Christie Matheson shows us how we can become eco-friendly mavens in her new must-read book Green Chic: Saving the Earth in Style. Cotton: Buy organic cotton which is grown without pesticides or chemical fertilizers. Translation – it won’t seep into the air, water, or your skin. Check out American Apparel tees and the new organic denim line from Levi’s. Wool: Look for wool that hasn’t been chemically treated or dyed. You can also buy non-dyed wool in natural colors or wool that has been dyed with dirt or clay dyes. Try John Patrick Organic and Indigenous Designs. Another alternative is alpaca wool – it’s naturally softer and stronger than regular wool and uses less chemical treatment when conventionally produced. Linen: Look for high-quality, 100% linen that hasn’t been blended with synthetics or nonorganic cotton. Go to Beklina.com for great linen pieces. Silk: This is a win-win. It’s actually one of the most eco-friendly fabrics since it is renewable and biodegradable. Check out CoolNotCruel.com. Mani-pedi: Use brands that are free of toluene, phthalates, and formaldehyde such as Spa Ritual (SpaRitual.com) or Firoze. Hair: Skip shampoos and conditioners with ingredients that include formaldehyde, bronopol, parabens, and sodium laurel sulfate. These toxic chemicals go straight into your bloodstream and are not detoxified by the liver. Instead try Vanilla & Sweet Orange Shampoo from Hugo, and shampoos and conditioners from Burt’s Bees (burtsbees.com) and John Masters Organics. ***General rule: if you can’t pronounce it, don’t buy it. Furniture: Refurbish or reupholster furniture you already own. Napkins: Choose cloth napkins and reusable rags instead of recycled paper towels and paper napkins. Try Ortolan napkins or Libeco linen napkins.